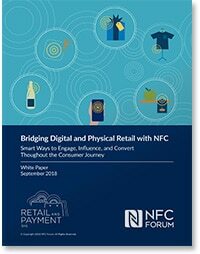 ‘Bridging digital and physical retail with NFC’ includes detailed listings of tips and ideas for how brands and retailers can make use of NFC technology at each stage of the customer journey. Eleven tips for running a successful NFC campaign are also provided. “To be successful today, brands and retailers need to compete more effectively in a mobile-first, omnichannel world,” the authors explain. “NFC technology offers a multitude of ways for brands and retailers to forge and strengthen a connection with the consumer at every step throughout their journey — pre-purchase, in-store, and post-purchase. “NFC helps consumers by connecting them to helpful information when and where it’s needed, offering a channel to interact with brands, delivering offers and rewards, providing the simplicity of one-tap payment, and more. Bridging digital and physical retail with NFC has been produced and sponsored by the NFC Forum and approved by the NFC World editorial team. This 17-page white paper is available free of charge to NFC World Knowledge Centre members (PDF format, 1.7MB).